The ANTHRO-INSPIRED Crochet Collar Cardigan! Yep. You read correctly. I know, it doesn't really look like much other than a yellow sweater up there in that picture, but I assure you, it is much cooler than that. Really. Remember here, when I explained my theory about knock-offs? That being, essentially, that I refuse to do them since I'm convinced that I will never be able to sufficiently fake a high-end look and will forever be reminded of my failings whenever I look at said attempt? Which is why I've made only one knock-off in my life. Well, scratch that. TWO now. 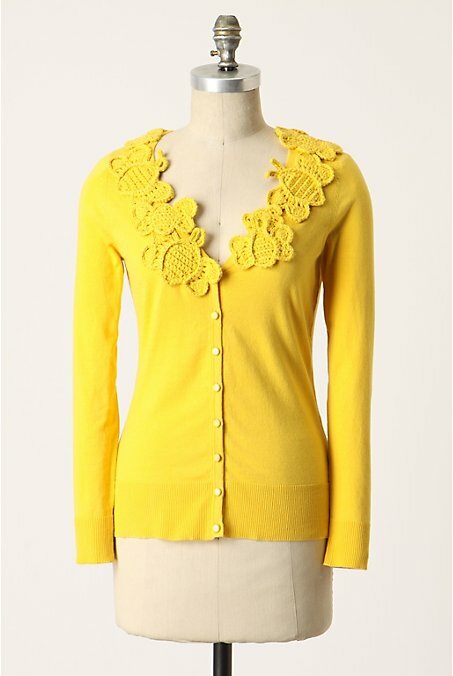 I saw the anthro "All Abuzz Cardi" and knew I had to have it. It was NECESSARY to my survival. 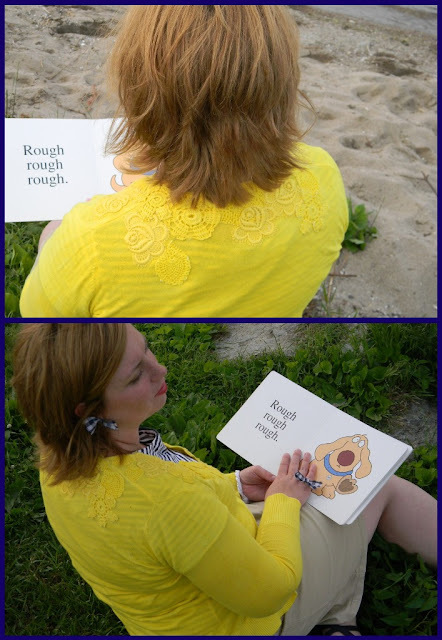 However, this chica is NEVER gonna be spending Anthro-style dough. 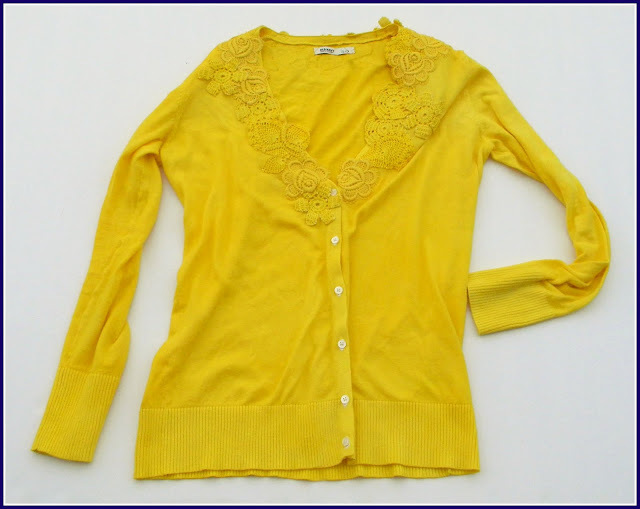 And again, sorry to say, this cardi is no longer available through anthropologie. Sigh. Ok, so I know it's obviously not the same. I don't really crochet - and by "don't really" I mean "don't at all" so it's not like I could just whip up some big old yellow bees... although now that I think about it, MOM, COULD YOU GET ON THAT? K, thanks. ANYWAY... so I knew I wasn't going to make an exact duplicate. Fortunately, though, I think I got the FEELING right. 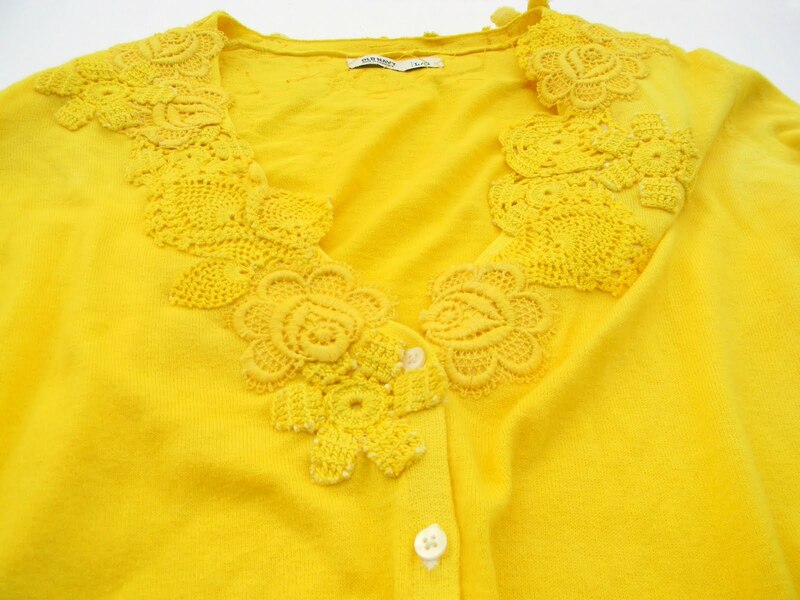 All ended up with a bright yellow cardigan I'm in love with. Yea! Want one? You can totally do this. 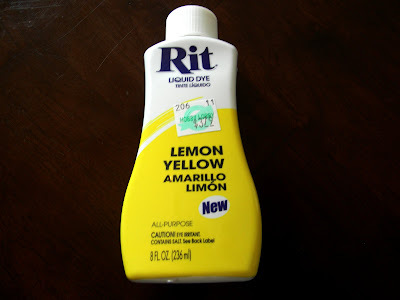 Lemon Yellow RIT dye - LIQUID. LIQUID, LIQUID, LIQUID. Should I say it again? Spend the tiny bit extra and save yourself from the headache - nay, BODY ache - of powder dye. 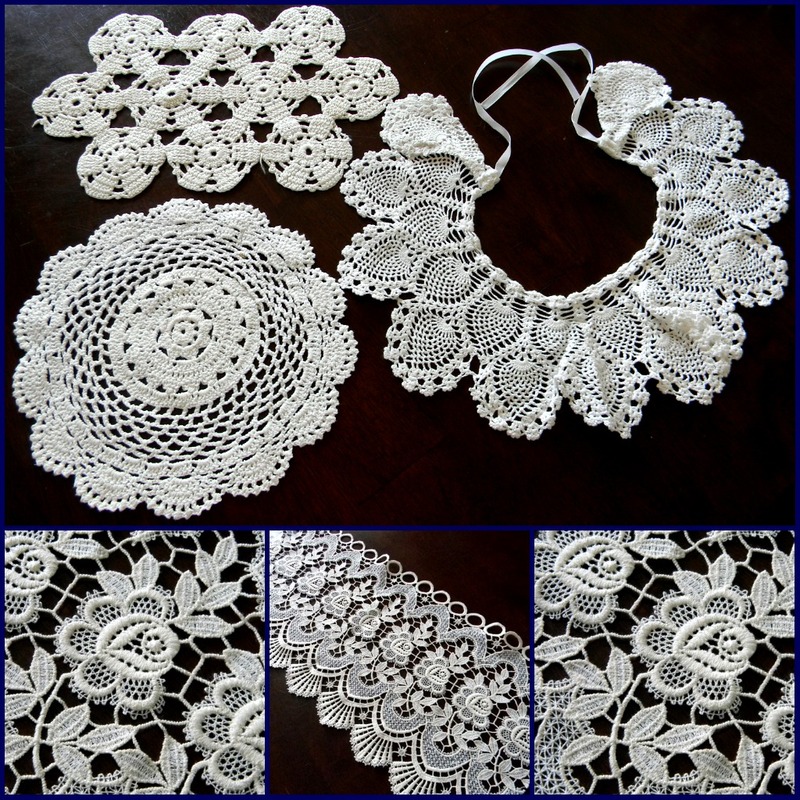 Crochet doilies, collars and other pieces - thrift store hunting here, people. You can't go wrong there. 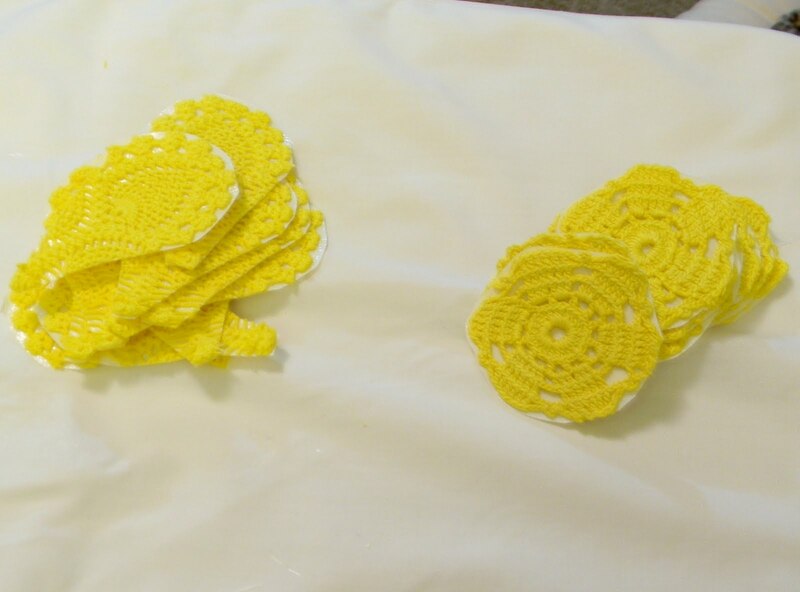 Each of my crochet pieces was under a dollar. Heavy Duty Heat N Bond - gotta be heavy duty, people. An iron - I mean, you have to use it for something, right? 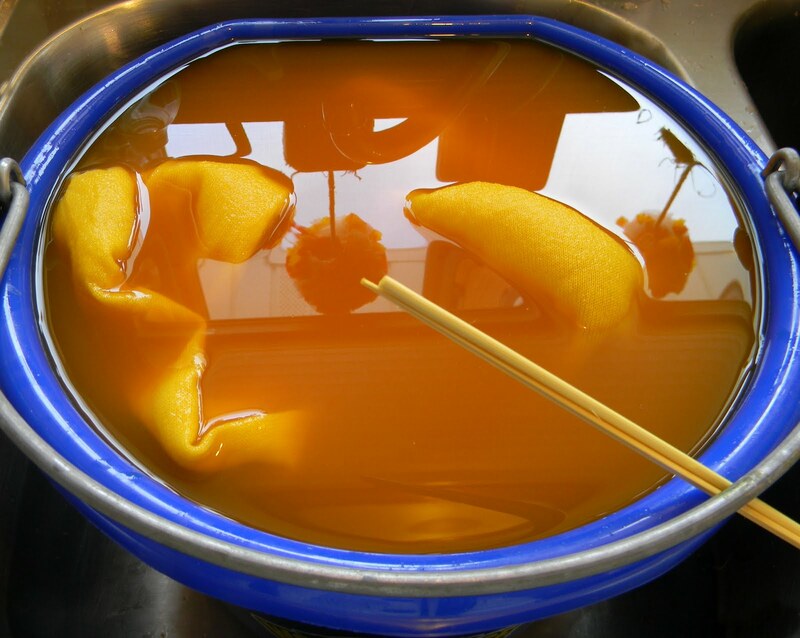 Follow the instructions on the dye for mixing and timing. 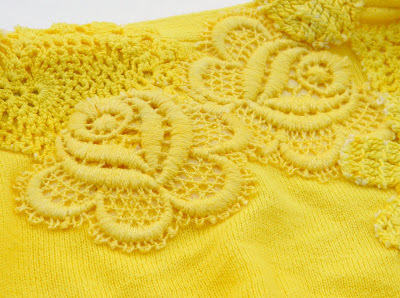 Dye both your cardigan and your crocheted lace. I left mine in a little extra time to make sure it was all really vibrant. I ended up using parts of all of the lace EXCEPT the round doily in the picture above. So, initially, I just cut the long piece of crocheted lace into strips to make it easier to work with. 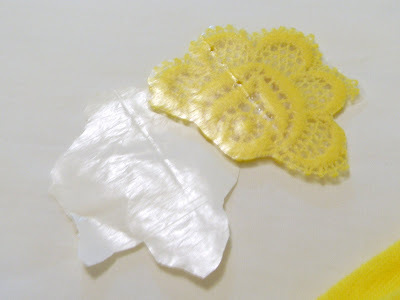 If you have large pieces of lace that have pretty clear divisions of sections, you can cut it apart into manageable sizes. 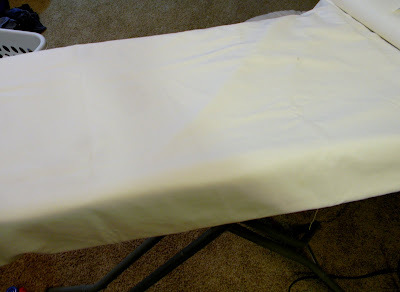 Now, cover your ironing board with something you don't mind ruining. Take it from me and my previous mistakes. COVER YOUR BOARD. This is what led to me purchasing a new board and cover. So, I guess if you really want an excuse to ditch your old crappy board that you got at the DI when you were brand newly married, then NO, DON'T cover your board. Otherwise, cover it. Then, and I know, this is pretty hard to see, sorry, place your strip of lace face down on the board, and place a strip of heat n bond over it. I made this awful picture extra huge so you can kind of tell. Then, simply follow the heat n bond directions. Iron that strip right onto your lace. 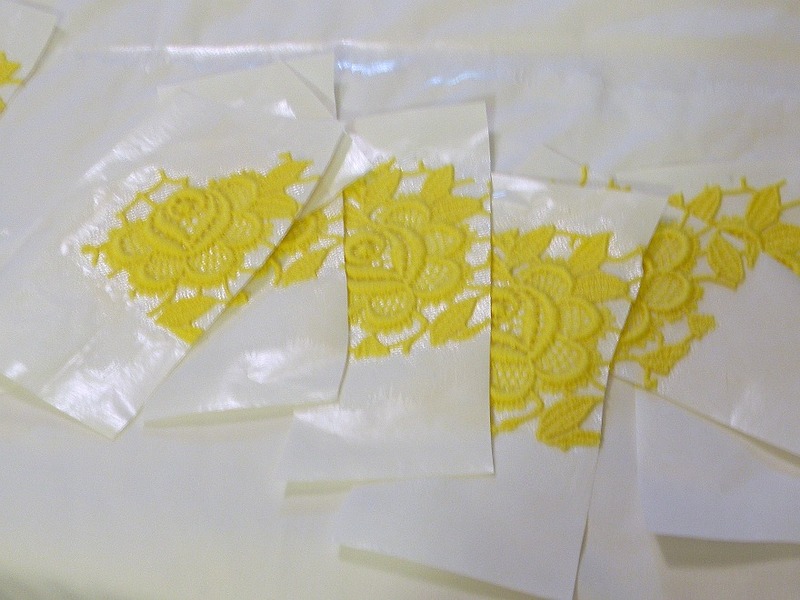 Flip your lace over... see? Nice and stuck. 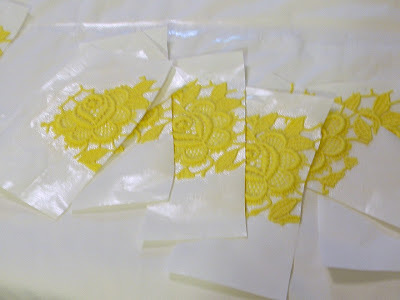 Now, trim around each shape - very, very close to the lace. Do this with the other shapes you want to use as well. Same exact method. 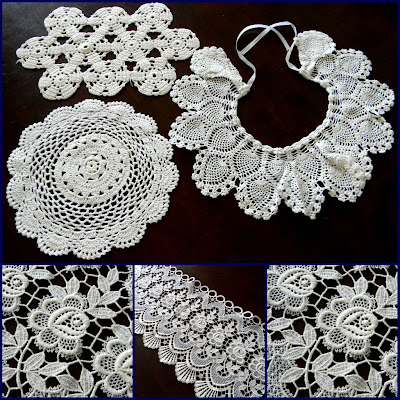 I used some leaf shapes which I cut out of that crochet collar and some flower shapes which I cut apart from that crochet placemat thing. Now, lay out all of your pieces on along your collar to get an idea of pattern. Overlap some pieces and make sure some overlay the collar. Make it random. 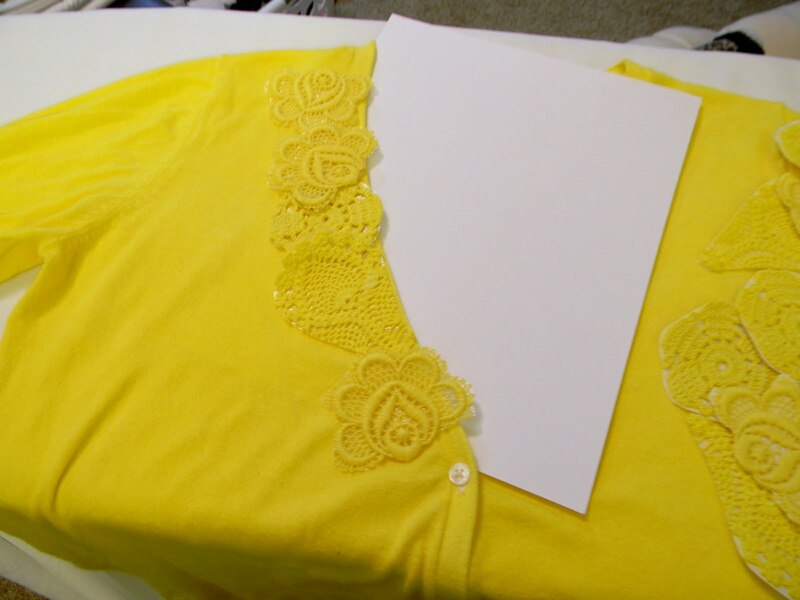 Once you like the order and pattern, take each piece off, one by one, peel off the back and then replace it where you want it on the collar of your sweater. Lay some card stock in your sweater to protect the inside - you don't want to end up ironing the collar pieces to the inside of your sweater. Which is totally something I would do. So I'm impressed with myself that I thought to do this. 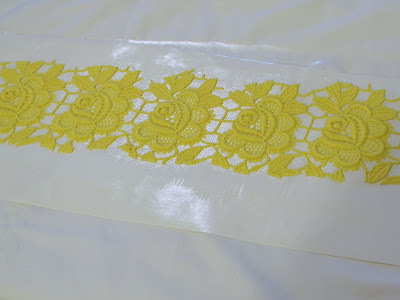 Then, just lay your iron right on the lace and press. It'll take some pressure and time, don't get antsy. 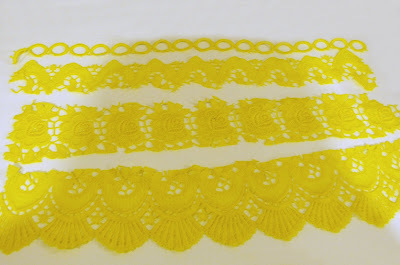 And look, you've still got all this left over bright yellow lace to... uh, do SOMETHING with. 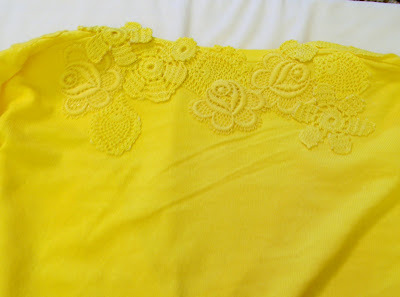 Now, you'll take your yellow thread and little needle and simply hand sew some stitches through every.single.piece. 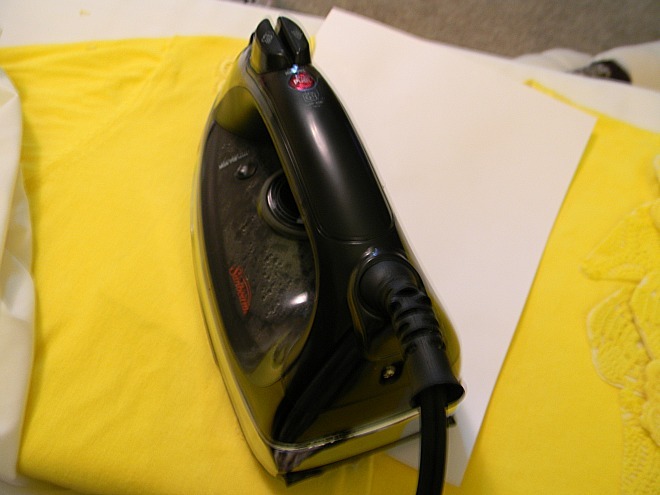 you just ironed on. I mean, I hand sewed multiple stitches in multiple places. Took a while. 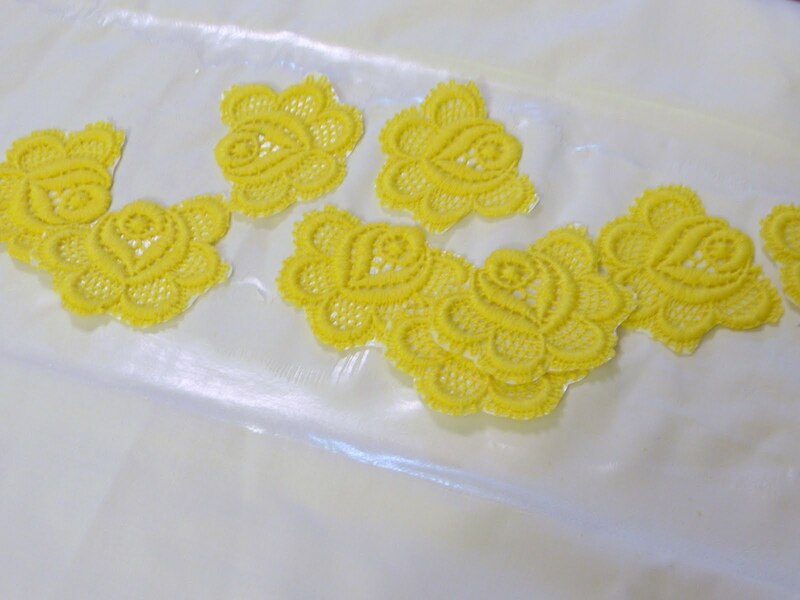 Here's a close up of those rose/bee things. I kind of love them. And I know what you're thinking. 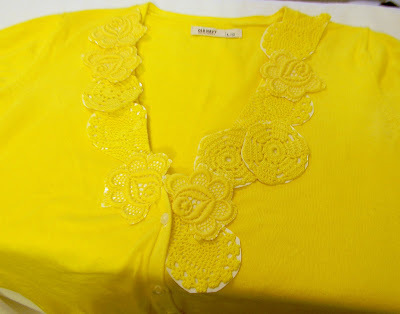 A sweater for a summer outfit? What the what? BUT, do you know how chilly it can get on the water? I mean, we don't actually own a yacht, but if we did, I'd need a sweater for the evenings. ALSO, did you forget that we live in the frozen tundra and that "Early September" is synonymous with "Onset of chilly fall weather which lasts for approximately .3 weeks and then gives way to frigid cold winter"?? Well. 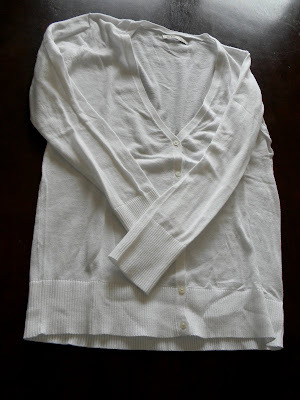 I will be needing this cardigan even MORE soon. I clothed my family for $16.32! 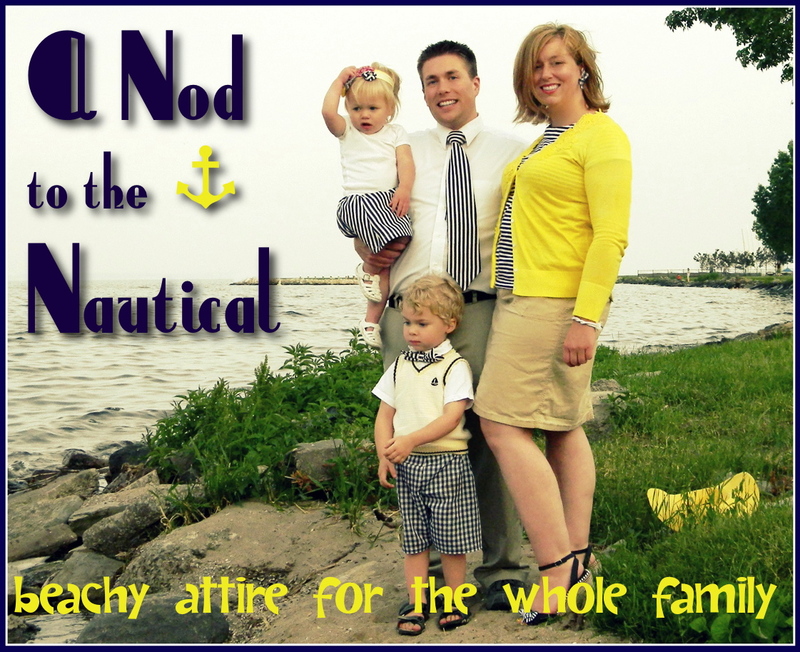 (give or take a bit based on you know, guesstimates) And we look all fancy nautical now. You can't put a price on that. What a cool idea! 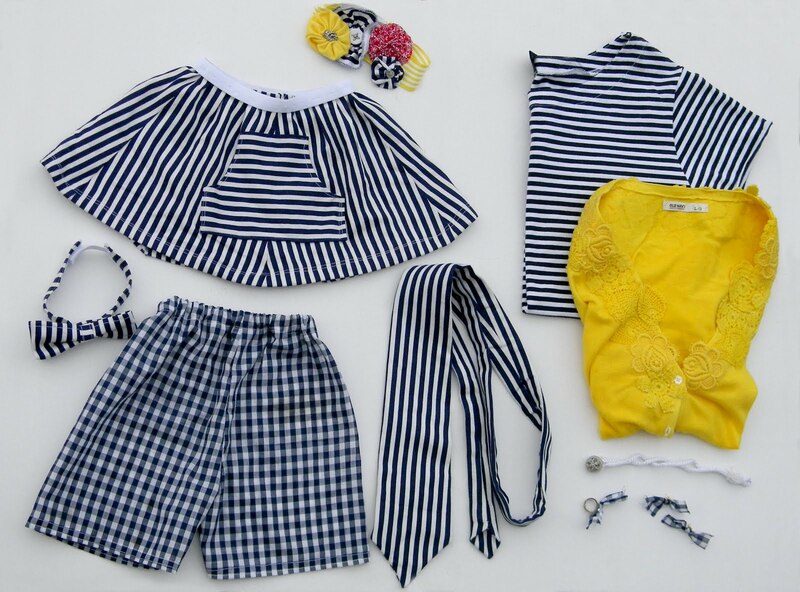 Thanks for sharing all the information on your nautical outfits. I've really enjoyed all the posts! omg you're a genius! I LOVE THIS! I would have never thought of doing this, but I loooove the result!! This turned out beautifully! 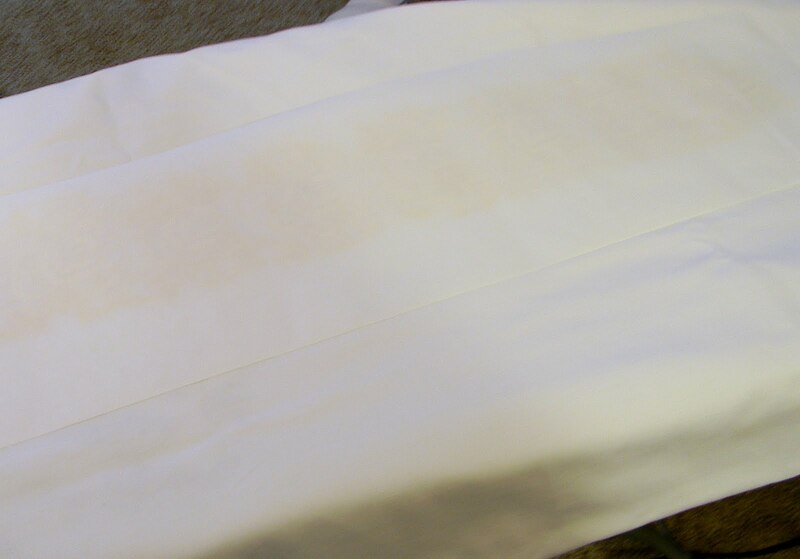 I've never tried dying fabric...I never would have guessed that's how you did this. Love it! UMM YES Please, this is INCREDIBLE. FIrst of all I'd say you TOTALLY pulled that knock off OFF, lol. 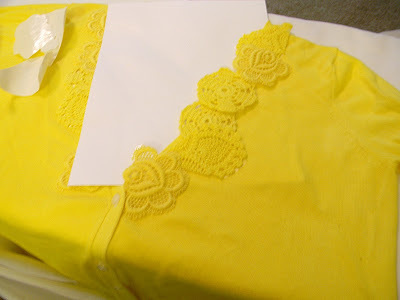 I love the yellow, and what a great step by step. I am pinning this, and sharing on my facebook page, this is RAD. Thanks for sharing this, I have a couple PLAIN ugly sweaters I could make pretty too, YAY!!! p.s. If you get a chance I'm inviting you over to my blog, I'm kinda having a HUGE giveaway going on, and you MIGHT like it, (or LOVE it). I'd be so happy to have your support! Um, I totally 100% love this to pieces. And holy crap, $16? You are amazing. Fabulous tutorial, K! 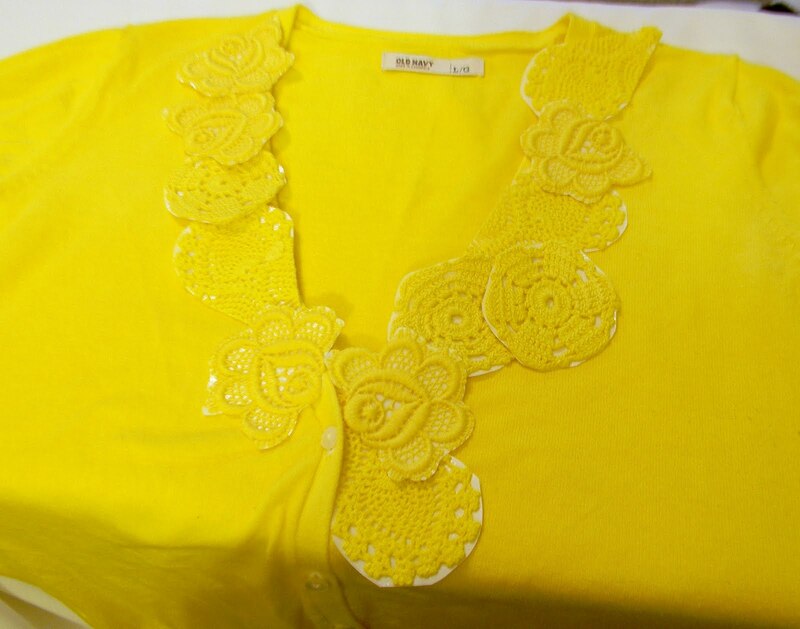 the lacy collar is sooo gorgeous and looks fun! Love this! I think I like yours better than the anthro one. I don't know if I would want to wear the bees. This is awesome!!! 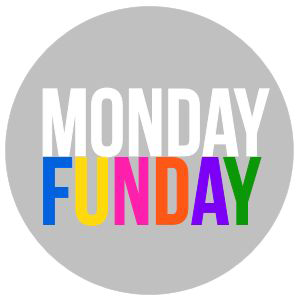 And there are so many different color possibilities when you know you can dye it whatever color you want! Thanks for sharing! that is amazing, it looks really expensive. I have never dyed clothes, you have made me want to give it a go! I LOVE this!!! You are so talented. I love seeing anthro knockoffs, especially when its DIY. Wow! I love the sweater! I'm going to have to try that! Amazing! I'll have to try dying cardigans now! This is really really good- I love the color and I had never thought to use doilies to make "faux crochet" but that is just brilliant! Great job and the family looks adorable too! amazing! Don't think I'd have the patience to do this, but love how yours turned out. The yellow looks beautiful with the navy stripes!!! Words can't even describe how fabulous this is! I am loving all of it. You are SO talented, seriously! Absolutely love this! 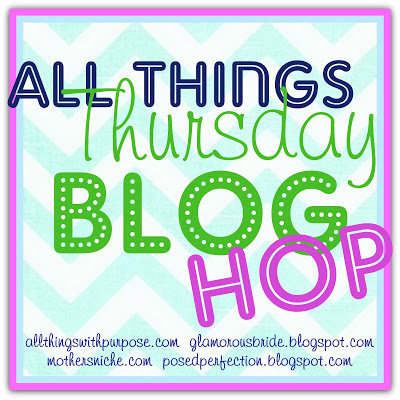 I'm featuring it on my blog! Come grab a featured button! 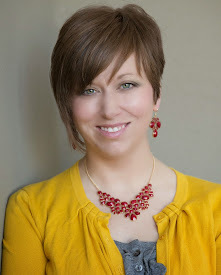 Thanks for linking up to Show & Share! love. this! You did a great job! So creative! This is awesome! You did a great job. 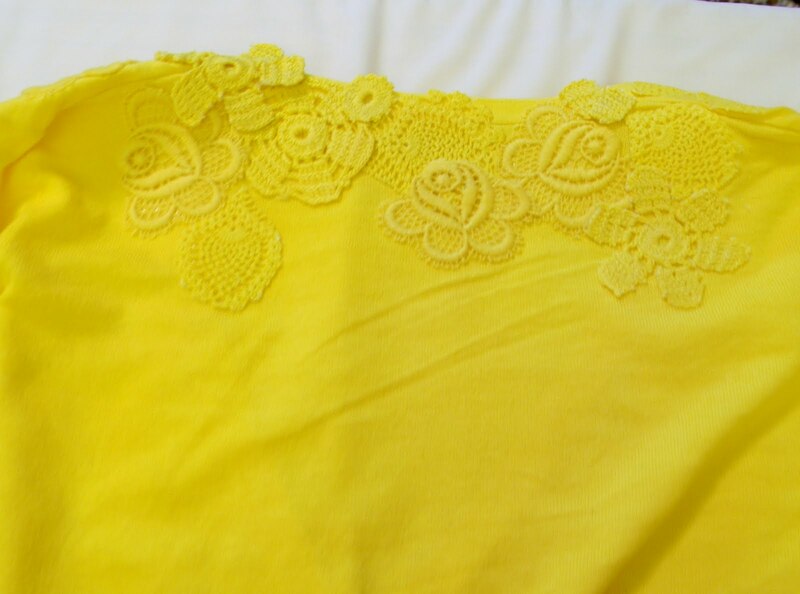 Love the yellow!